The Free Iceberg PowerPoint Diagram is a concept diagram slide for the success theory of achieving objectives. The template contains the iceberg illustration to present the performance and progress of an individual or the company. It is a powerful diagram template with its usage in several industries including academic learning, business development and scientific research. The iceberg diagram portrays the phenomenon of the amount of struggle and hard work visible to public. Like the original iceberg, where 90% of glacier is below the surface. Similarly, this business template PowerPoint helps demonstrate the basics knowledge about the vast subject. For instance, the doctors can explain the long-term side effects of treatment. Or, the project management team can display the effects of scope change during the development or implementation process. The amazing Free Iceberg PowerPoint Diagram ideal situations where vast amount of information is hidden. The small amount of knowledge is visible as ‘Tip’ of the iceberg. Whereas, the rest of mass knowledge is below surface. The free PowerPoint28 template therefore, is ideal for explaining the individual’s progress towards the success. It can visually display how struggle is invisible until it shows exceptional results. 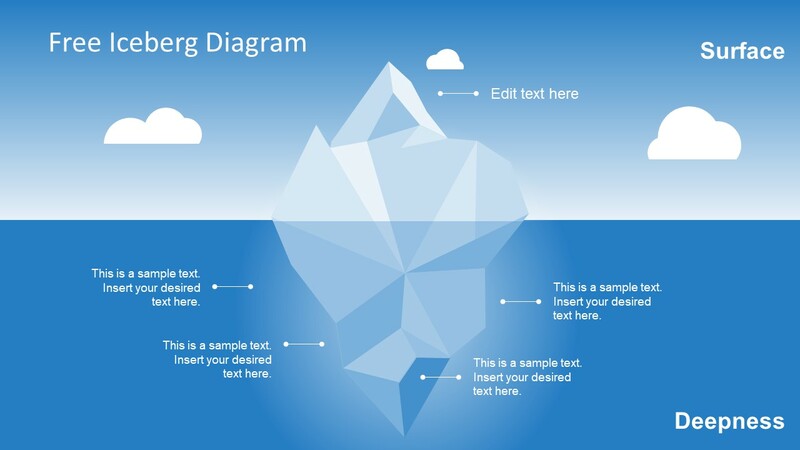 The iceberg free diagram template for PowerPoint has the glacier clipart image of polygon shapes. Further, there are four text placeholders available to add information about the deepness and one placeholder for the surface. Moreover, these are an editable free PowerPoint business templates with several options to personalize it. The professional design of iceberg PowerPoint diagram is also an easy to use and 100% customizable PowerPoint. Copy this free slide for existing presentation or create duplicates free diagram templates. The customizations include background, shadows, gradient and transparency effects. Further, the users can modify text placeholders by altering size, font and color. Communicate the information with impressive free PowerPoint template designs of maximum visual impact. Such as, sustainability strategies, potential risks, or decision making.